We always knew they had that certain something, that undefinable “star quality” that has everyone asking for more… and now it seems Nine News Sunshine Coast agrees with us. Our sea stars and other marine animals were featured in a recent television news story celebrating their contribution to Seaweek 2017. A camera crew followed us to Kindamindi Childcare Centre on the Sunshine Coast to see first-hand the work of our “star” ambassadors. Its long been accepted that as humans we care more about things we experience ourselves and touch is an important sense in making that connection. Once we have a greater understanding of the fragile marine ecosystem, and the impact it has on our lives, then we are invested in wanting to protect it, and ensure its survival for generations to come. 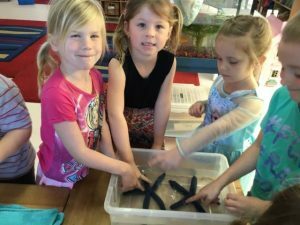 As with most things, starting young is the key to success, so with every pre-schooler who learns to love our sea creatures, the better the chance the ocean will receive the attention it deserves. This entry was posted in Uncategorized on September 19, 2017 by oceanlifeeducation.